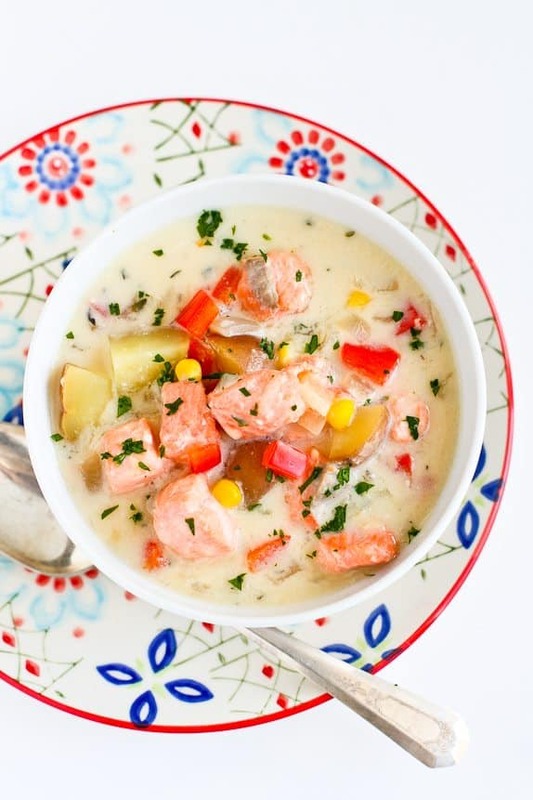 This healthy salmon chowder recipe allows you to indulge in a creamy potato soup without the guilt. Delicious and comforting! Thank you to The Little Potato Company for helping me to share this recipe with you. Driving up the winding Sea-to-Sky Highway from Vancouver, Canada to the town of Whistler (home of one of the world’s top ski resorts) is not just a feast for the eyes, with the stunning ocean and mountain views. Tucked into a quiet enclave just north of the town of Squamish is Brackendale, home to the annual month-long Bald Eagle Festival and bald eagle count, which boasts the world record count of 3769 eagles in 1994. If you’ve ever been mesmerized by the sight of a bald eagle soaring in the sky, try to imagine what it would be like to stand on the shores of the Squamish River, surrounded by trees that are covered with hundreds, even thousands, of the majestic birds. Whether the eagles are perched in the trees, keeping keen eyes focused on their surroundings, or they are swooping towards the river to pluck salmon out of the river, it is an experience that you will never forget. If you stop to see the eagles, be sure to stop in first at the Brackendale Art Gallery Theatre Teahouse (yes, you read that right). The owners will be able to point you towards the best viewing spots, show you works by local artists and promise you a bowl of salmon chowder that will knock your socks off. It’s been 15 years since my husband and I first tasted that chowder (though not the last time) and it’s sumptuous flavors and creamy texture sticks in my mind as though it was yesterday. 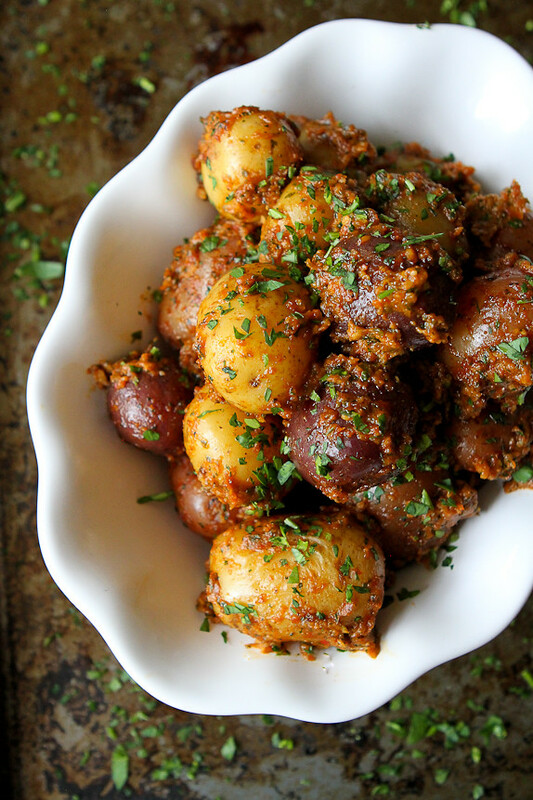 Last month, I made Creamer Potatoes with Red Pepper Cashew Pesto with my favorite potatoes from The Little Potato Company. 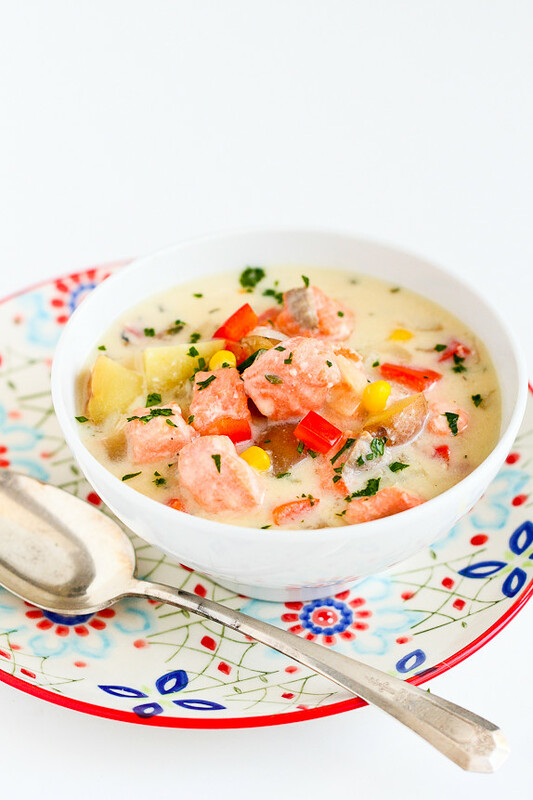 Sweet and creamy, these fully mature small potatoes are available in numerous varietals, including the Blushing Belles that I used for this salmon chowder. Blushing Belles are extremely versatile, adapting to a variety of cooking methods. Their red skins and buttery yellow flesh look beautiful in the soup and taste even better. That being said, any of the Creamer potato varietals could be used with this recipe. The Little Potato Company Creamers are grown in the United States and Canada, and are not genetically modified. They are naturally sweet because the potatoes are actually fully matured, rather than “baby potatoes” that are harvested before reaching maturity. That means two things…better flavor and better texture for mashed potatoes, roasted side dishes, soups and so many other dishes. So, how did I lighten up this chowder without sacrificing chowder? I followed the template of my Light Turkey & Corn Chowder. In that recipe, I subbed out whole milk with lower fat milk and broth, and thickened up the soup with a roux rather than heavy cream. The result is a chowder that’s lower in calories and fat grams, but still lusciously thick and flavorful. Heat the olive oil in a large saucepan set over medium heat. Add the onion, celery, and red bell pepper, and cook until the vegetables are beginning to soften, about 5 minutes. Add the garlic, thyme and red pepper flakes, and cook for 1 minute. Add potatoes and vegetable broth. Bring to a boil, then reduce heat slightly and simmer until the potatoes are tender, about 15 minutes. Add the corn and simmer for 2 minutes. Slowly whisk the milk mixture into the soup, along with the salt and pepper. Cook, whisking frequently, until the soup is starting to thicken, 8 to 10 minutes. Stir in the salmon and cook until the salmon is just cooked through, 6 to 8 minutes. Disclosure: This post is sponsored as a part of a brand ambassadorship for The Little Potato Company. All opinions are my own. I am always looking for new ways to enjoy salmon…this looks delicious! And my favorite way to cook with potatoes: definitely roasting them with a little EVOO and salt, SO MUCH YUMMINESS! Chowders are one of my favorite fall/winter soups! Love this combo. I love to just eat a baked potato with a little bit of salt. Perfection! The soup sounds A-MAZING! But, the bald eagle experience even better–adding to my bucket list! I love this beautiful soup! It’s a great mix of summer and fall! This looks yummy,will make today.Where we live (B.C) I see eagles just about every day out my kitchen window! What a place! I want to book a ticket asap. AND bring this delicious chowder with me! My husband is the skier and he would absolutely love it there. I like to use potatoes in soup and this one looks good. I love those little potatoes 🙂 This chowder sounds like something I need to try ASAP! I love how you lightened this up. Little potatoes are the best! I would roast them for dinner and use the leftovers…if there are any…mixed with eggs for breakfast the next day. I love making crispy smashed potatoes–boil the potatoes, crush with the bottom of a glass, coat with oil, salt and bake until crispy. Amazing! 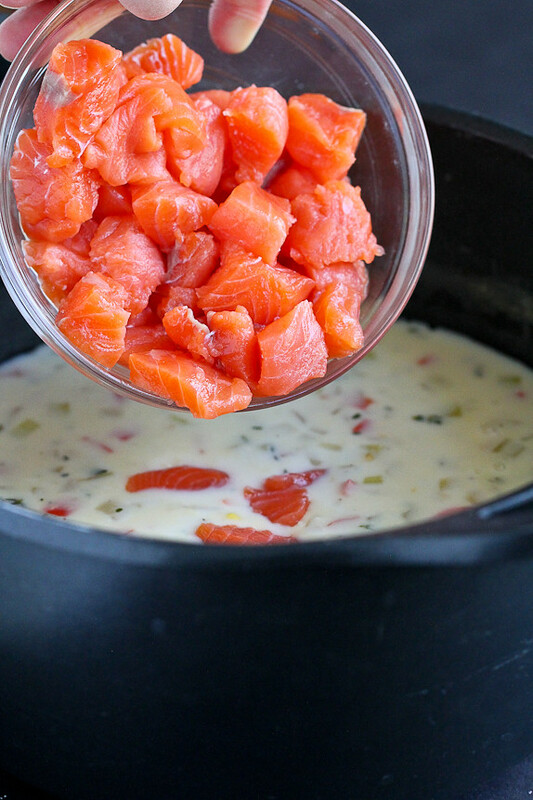 I have never made a salmon chowder! This looks incredible!! 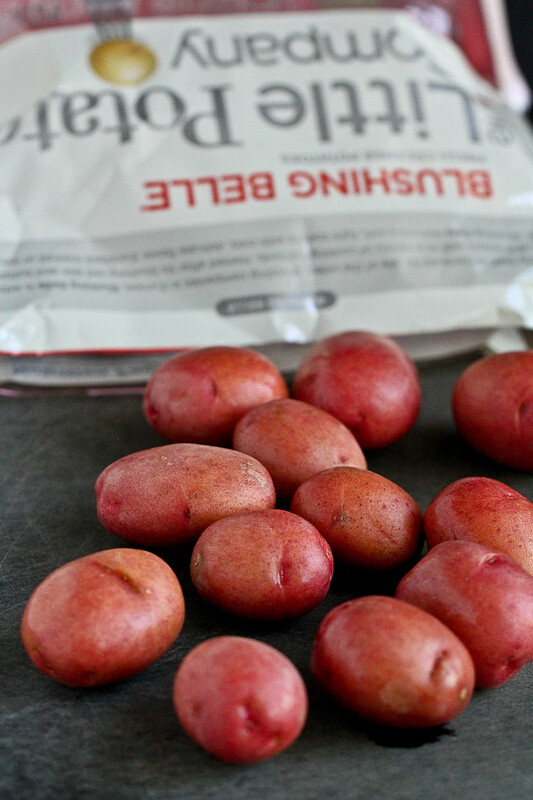 Roasted potatoes are a family favorite, and these little potatoes roast like a dream. My favorite way to enjoy potatoes is to roast them w/ garlic until their crispy! Mmm, just in time for the cooler weather. I love them roasted with garlic and rosemary and a little white wine. Ok, I would have never thought of adding salmon to soup. In my head I always thought it would break up when it was cooking. This is genius! SOooo giving it a try! Pinned! Oh boy this truly looks fantastic. I need to start making more soups soon! This chowder looks wonderful! And I love those potatoes!! That is some gorgeous looking salmon! And what a lovely healthier, lighter chowder. Those creamer potatoes must be fantastic in there! Still can’t get over that cashew pesto recipe. SO delicious looking! I love your plate – and what’s on it, of course 😉 I love chowder and a lighter version is definitely a bonus! I know from a recent trial and error how important it is to pick the right potatoes – so glad you included the name of the variety! YUM! You make me really want to visit Canada! I know it’s beautiful and it’s high on my list of places I want to visit. I’d love to see eagles plucking fresh salmon right out of the water. How exciting! Your chowder looks so fresh and colorful. You can tell it’s healthy just be seeing all those vibrant colors! When we lived in Ohio we saw a bald Eagle (and nest). it’s truly mesmerizing to watch them fly!! I love this chowder recipe too! Oh Dara, that Eagle experience sounds incredible. And that is one beautiful bowl of chunky chowder. Yay for soup season, finally! Bring on the chowder season! I’m putting this recipe on my winter food list! I love chowder—and with big chunks of salmon and potatoes???? Amazing! You have me wanting to take a trip to the Squamish River. We love gazing at the birds. My goodness, does this soup look utterly delicious. Those hearty chunks! Pinned. These potatoes sound delicious – I love a small, creamy potato. And salmon in potato chowder sounds awesome. Beautiful chowder! I made this recipe last night for dinner and it went over so well with my family. My kids, who don’t like baked or grilled salmon, went back for second helpings. 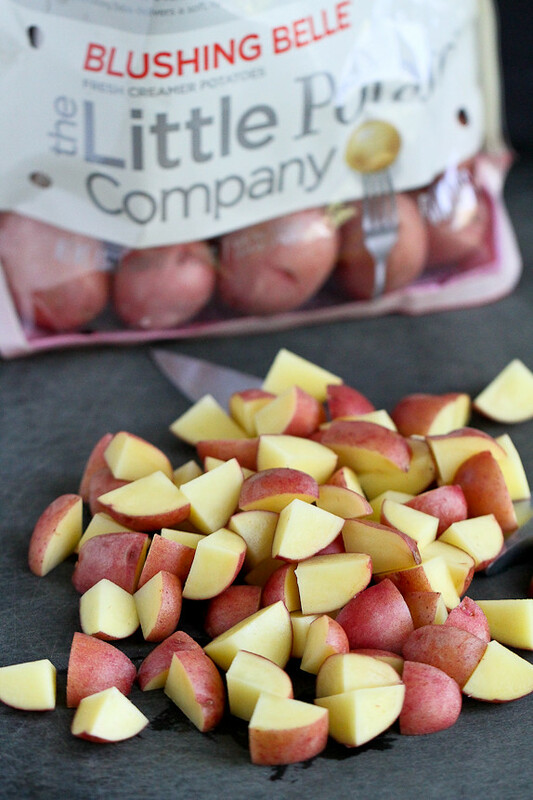 I found the Little Potatoes at our grocery – never tried them before – and they were so good! This is a recipe we’ll definitely make again.